Female 5 ft. 4 in. +2d6 in. Ability Score Modifiers: Elves are nimble, both in body and mind, but their form is frail. They gain +2 Dexterity, +2 Intelligence, and –2 Constitution. Size: Elves are Medium creatures and thus receive no bonuses or penalties due to their size. Base Speed: Elves have a base speed of 30 feet. Languages: Elves begin play speaking Common and Elven. Elves with high Intelligence scores can choose from the following: Celestial, Draconic, Gnoll, Gnome, Goblin, Orc, and Sylvan. See the Linguistics skill page for more information about these languages. Darkvision: Though uncommon, some groups of elves are born with darkvision, rather than low-light vision. In many cases this is taken as a sign of a drow in the elf’s ancestry, and can lead to persecution within the elf’s home community. Elves with this racial trait gain darkvision with a range of 60 feet, but also gain sensitivity to light and are dazzled in areas of bright light or within the radius of a daylight spell. This racial trait replaces low-light vision. 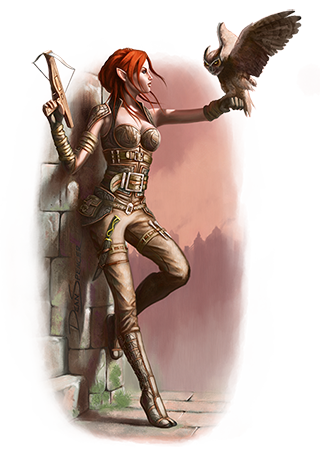 Desert Runner: Some elves thrive in the deepest deserts, forever roaming across burned and parched lands. Elves with this racial trait receive a +4 racial bonus on Constitution checks and Fortitude saves to avoid fatigue, exhaustion, or ill effects from running, forced marches, starvation, thirst, or hot or cold environments. This racial trait replaces elven magic. Elemental Resistance: Elves who dwell in the most extreme environments, from arctic wastelands to volcanic plains, develop natural resistance to the dangers of their homelands over the course of a few generations. Elves with this racial trait gain elemental resistance 5 to acid, cold, electricity, or fire. This choice is made at character creation, and once made it cannot be changed. This racial trait replaces elven immunities. Envoy: Elves often have trouble relating to neighbors of other races, especially those with much shorter lifespans. As a result, some are trained in minor magics that are particularly useful when dealing with non-elves. Elves with this racial trait and an Intelligence score of 11 or higher gain the following spell-like abilities once per day: comprehend languages, detect magic, detect poison, and read magic. The caster level for these effects is equal to the elf’s level. This racial trait replaces elven magic. Eternal Grudge: Some elves grow up in secluded, isolationist communities where generations-old slights and quarrels linger as eternal blood feuds. Elves with this racial trait receive a +1 bonus on attack rolls against humanoids of the dwarf and orc subtypes because of special training against these hated foes. This racial trait replaces elven magic. Fleet-Footed: While all elves are naturally lithe and agile, some also are naturally speedy and have a strong desire to rush into situations rather than worrying about looking ahead. Elves with this racial trait receive Run as a bonus feat and a +2 racial bonus on initiative checks. This racial trait replaces keen senses and weapon familiarity. Silent Hunter: Elves are renowned for their subtlety and skill. Elves with this racial trait reduce the penalty for using Stealth while moving by 5 and can make Stealth checks while running at a –20 penalty (this number includes the penalty reduction from this racial trait). This racial trait replaces elven magic. Spirit of the Waters: Some elves have adapted to life in tune with the sea or along the reedy depths of wild rivers and lakes. They gain a +4 racial bonus on Swim checks, can always take 10 while swimming, and may choose Aquan as a bonus language. They are proficient with longspear, trident, and net. This racial trait replaces elven magic and weapon familiarity. Urbanite: Elves who live in cities for more than a century can grow to know the ebb and flow of social situations just as their forest-dwelling cousins know the rules of the wild. Elves with this racial trait gain a +2 racial bonus on Diplomacy checks made to gather information and Sense Motive checks made to get a hunch about a social situation. This racial trait replaces keen senses. Woodcraft: Elves know the deep secrets of the wild like no others, especially secrets of the forests. Elves with this racial trait gain a +1 racial bonus on Knowledge (nature) and Survival checks. In forest terrain, these bonuses improve to +2. This racial trait replaces elven magic. Arctic Elf: These elves were born and raised in the frozen lands of the far north or south, and have dealt with freezing deserts, nights that last for weeks, and the horrors that roam the cold terrain. These elves have the darkvision, desert runner, and elemental resistance alternate racial traits. Dusk Elf: Rather than being tied to the terrain around them, some elves are linked to the night itself. Though not tied to demon worship and evil as drow are, these elves are similarly attuned to the magical concepts of darkness and shadow. These elves have the arcane focus, darkvision, dreamspeaker, and silent hunter alternate racial traits. Savage Elf: In lands where every day is a constant struggle to survive and the niceties of civilization are rare, elves adapt to depend on swift strikes and lifelong vigilance to keep their families alive. These elves have the eternal grudge and fleet-footed alternate racial traits. Tower Elf: Some elven institutions of magical learning date back centuries, and entire clans of elves have lived for generations as caretakers, students, and instructors of these self-sufficient schools of wizardry. These elves have the arcane focus and urbanite alternate racial traits. Arcanist: Increase total number of points in the arcanist’s arcane reservoir by 1. Bard: Add +1 to the bard’s CMD when resisting a disarm or sunder attempt. Bloodrager: Add 1 foot to the bloodrager’s base speed. In combat, this only has an effect for every five increases in base speed. This bonus stacks with the bloodrager’s fast movement class feature, and applies under the same conditions and that feature. Brawler: Add 1 foot to the brawler’s base speed. In combat, this has an effect only for every five increases in the brawler’s base speed. Gunslinger: Add +1/3 on critical hit confirmation rolls made with firearms (maximum bonus of +5). This bonus does not stack with Critical Focus. Hunter: Choose a weapon from the following list: longbow, longsword, rapier, short sword, shortbow, or any weapon with “elven” in its name. Gain a +1/2 bonus on critical hit confirmation rolls made while using that type of weapon (maximum bonus +4). This bonus does not stack with those gained through Critical Focus and similar effects. Inquisitor: Add one spell known from the inquisitor’s spell list. This spell must be at least one level below the highest-level spell the inquisitor can cast. Investigator: Increase the total number of points in the investigator’s inspiration pool by 1/3. Ranger: Choose a weapon from the following list: longbow, longsword, rapier, shortbow, short sword, or any weapon with “elven” in its name. Add +1/2 on critical hit confirmation rolls made while using that weapon (maximum bonus of +4). This bonus does not stack with Critical Focus. Rogue: Add +1 to the number of times per day the rogue can cast a cantrip or 1st-level spell gained from the minor magic or major magic talent. The number of times this bonus is selected for the major magic talent cannot exceed the number of times it is selected for the minor magic talent. The rogue must possess the associated rogue talent to select these options. Skald: Increase the bonus granted by the well-versed class feature by 1/4 (maximum +8). Slayer: Increase the studied target bonus on Perception and Survival checks by 1/4. When the slayer gains the stalker class feature, he also gains this increase to the studied target bonus on Stealth checks. Summoner: The amount of time the summoner must spend to summon his eidolon is reduced by 1 round, to a minimum of 1 round. Swashbuckler: Increase the total number of points in the swashbuckler’s panache pool by 1/4. Warpriest: Add 1/2 to the number of times per day the warpriest can use blessings, but he can use these additional blessings on only those from the Air, Animal, Charm, Magic, Plant, or Sun domains. Witch: Add one spell from the witch spell list to the witch’s familiar. This spell must be at least one level lower than the highest-level spell she can cast. If the witch ever replaces her familiar, the new familiar knows these bonus spells. The following feats are available to an elf character who meets the prerequisites. The following classes and/or prestige classes are available to an elf character who meets the prerequisites.